The energy giant has a long history of success for its shareholders, and the details are interesting. The energy industry has grown to be an essential part of the U.S. economy, and ExxonMobil (NYSE:XOM) leads all of its American peers in size and importance in oil and gas. The integrated oil giant has given investors exposure to exploration and production, pipeline and delivery services, and marketing and refining. The stock has been highly successful, giving investors a 100-bagger in less than half a century and offering a lucrative dividend yield during most of that period as well. 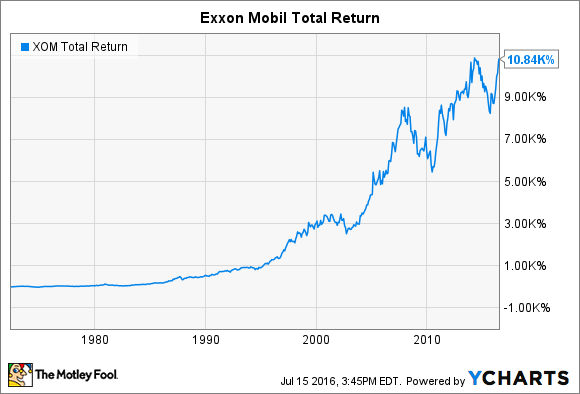 Let's look at ExxonMobil stock and how it has done in the past to see if it can keep up the pace going forward. As you can see in the chart above, ExxonMobil has had a strong stock history. Average annual returns of between 13% and 14% going back 45 years show just how consistent a performer the stock has been, and its history dates back to its roots under its former name of Standard Oil of New Jersey. Part of the way that ExxonMobil has performed so well is that it has been good at boosting its dividends over time. Its current yield of 3.2% is above the market average, but a 33-year track record of annual increases in its dividend payments is even more impressive. The stock qualifies as a Dividend Aristocrat, and even during tough times, ExxonMobil has been able to give shareholders dividend increases. Historically, Exxon has operated under several names, and its stock split history shows just how successful it has been. Below, you can see the splits it has made, along with what name it had at the time. ExxonMobil resulted from the merger of Exxon with Mobil in late 1999. Prior to that, Mobil dated back to its roots as Standard Oil of New York, and it had a storied stock history of its own. Mobil had fewer stock splits than legacy Exxon did, but it too had shown great success in the industry. In the merger, Mobil shareholders received 1.32015 shares of Exxon stock for every Mobil share they owned. Yet as you can see, the lion's share of ExxonMobil's gains has come from two distinct periods during the past decade or so. In the mid- to late 2000s, the price of oil soared to nearly $150 per barrel, and that sent stocks throughout the energy industry to all-time highs. When the financial crisis hit, the commodity market fell through the floor, sending oil prices below $40 per barrel briefly. Surprisingly, it didn't take long for oil prices to rebound, and triple-digit crude once again sent ExxonMobil to new all-time highs in the early 2010s. Yet the cyclical nature of the business once again asserted itself, and the latest oil-price crash briefly sent prices into the $20s and hurt ExxonMobil's stock. Even so, in the months since crude hit its lows, Exxon stock has bounced back and now sits very close to its old record levels on a total-return basis. ExxonMobil has always done a good job of bouncing back from periods of adversity. One advantage that the company has is its vertical integration, which helps some of its divisions offset weakness in others. For example, the drop in oil prices recently has hurt ExxonMobil's production business, but the refinery industry has performed much better because of relatively profitable spreads between crude and refined product prices. Exxon's exposure to both is part of the reason why investors haven't punished the stock as much as they have pure-play exploration and production companies. In the long run, even major price disruptions like what we've seen in 2015 and early 2016 are just momentary blips in the history of ExxonMobil. With a long-term focus and execution that remains laser-focused on finding new resources and exploiting them efficiency, ExxonMobil has a good shot at continuing to deliver strong returns to shareholders for the next half-century and beyond.